This gospel must be read very carefully. Jesus tells a story to make a point. It is just a story, it didn’t happen. However, we get the point. The scholar of the law knew the basic message of faith. We must love God and we must love our neighbor as ourselves. Then he asked a question to justify himself. He saw a loophole in Jesus’ teaching. Yes, love your neighbor, but who is your neighbor? That is the problem. Jesus then tells a story in which those you would expect naturally to give help to the beaten man, the priest and the levite (in early Christianity, another name for deacon, one who gives service) pass the poor man without a thought. Who gives help? It is the “other,” the heretics to the Jews, the hated Samaritan. He, the “other,” shows mercy. Whether this story happened or not is irrelevant. Jesus tells us that our neighbor may be someone we do not expect. Therefore, we cannot “justify ourselves” by prejudice and racism, by hating the other. This gospel preaches itself. When I was a young priest, the “other” in our church were blacks and Jews. Today they are immigrants and Moslems. And we, like the “scholar of the law,” are still racists. Racism is the ugly face of our church today. It blocks us from being “true-believing Christians. 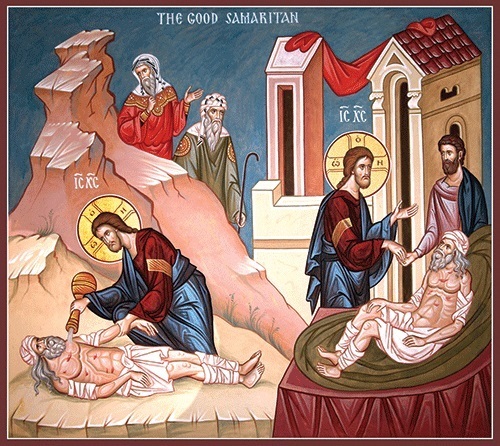 The scholar got the point, but he couldn’t say the hated word, “Samaritan,” but only “the one who treated him with mercy.” Jesus responds “Go and do likewise,” that is, do not hate the other, but always show mercy and care for the other. God’s word is clear, but do we have eyes that do not see, and ears that do not hear? Today, St. Paul tells us we are all one: “[strive] to preserve the unity of the spirit through the bond of peace: one body and one Spirit, as you were also called to the one hope of your call; one Lord, one faith, one baptism; one God and Father of all, who is over all and through all and in all” (Ephesians 4:4-6).